In my reading this past year, it seems a lot of my focus has been on middle grade fiction. This was not planned but it has worked out to be delightful. I just happen to have a daughter, 12, who loves to read. Lydia and I have enjoyed sharing books and discussing them. 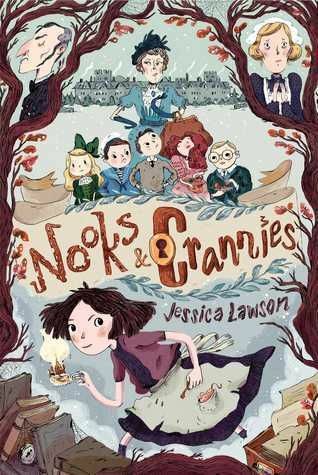 One book that we read a few months ago is Nooks & Crannies (Jessica Lawson). We were chatting about it again this morning while washing breakfast dishes and I realized I had failed to share about it here. Tabitha Crum’s life is lonely and dreary. Her parents treat her as a servant and not a beloved one. Her bedroom is the attic and meager fair serves as her meals.She is poorly dressed and her hair is a frumpy mess. Time at school is not much better. Her only friend is a mouse named Pemberley. Despite these circumstances, Tabitha finds enjoyment through the love of a good mystery and a healthy imagination. One afternoon Tabitha arrives home to find that her parents are leaving the country. Without her. They are leaving her at an orphanage to work since she has turned out to be such a disappointment to them. Circumstances take a twist. On this same day Tabitha receives an envelope containing a mysterious request to visit the Countess of Windermere. a wealthy recluse. Tabitha’s parents allow her to visit the Countess of Windermere in hopes of their own financial improvement. Tabitha, and five other children, are guests of the Countess. Why are they there? Is the Countess who she appears to be? Is the house haunted? What will happen to Tabitha? Nooks & Crannies is an excellent read for those who love a bit of mystery and suspense. The cast of characters is diverse. I loved how clearly the personalities came through in various interactions. The plot has a twist that I was not expecting. As I was reading, I thought I had the mystery solved. I was mistaken! Ah, the twist. Lydia and I had excellent conversations from reading this. There is much to be discussed about character, truth, family and friends. What guides the decisions we make? What do our actions reveal about us? Does everyone hide behind a facade? Nooks & Crannies is like A Little Princess, Annie, and Charlie and the Chocolate Factory mashed together and sprinkled with a bit of Clue. That is as much as I can give away. I can’t ruin the ending for you! This is a great independent read for perhaps ages 9/10 and up. However, it would certainly make a fabulous read aloud. If I had to do it again, I would definitely read it aloud. Highly recommend this read.